The BSE Sensex closed 179.79 points, or 0.51%, up at 35,649.94, and the Nifty 50 ended 66.35 points, or 0.62%, higher at 10,729.85. Two-wheeler sales in India is expected to grow at 8-10 per cent in 2018-19 amid concerns over increasing cost of acquisition disturbing positive demand drivers, according to ratings agency ICRA. Supported by growing per capita income, improved farm sentiment following near-normal monsoon over the last three financial years, higher minimum support price (MSP) and farm loan waiver in select states, the domestic two-wheeler industry volumes are expected to grow at 8-10 per cent during FY2019, ICRA said in a statement. PTIHero MotoCorp shares were up nearly 1%, TVS Motor rose 0.5% and Bajaj Auto was up 0.4%. The BSE Sensex traded 160.69 points, or 0.45%, down at 35,309.46, and the Nifty 50 fell 37.80 points, or 0.35%, to 10,625.70. 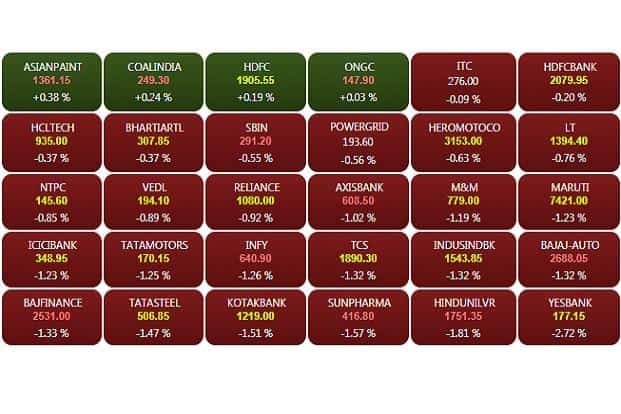 Intraday, the Sensex plunged as much as 35,010.82 and the Nifty slumped 128.95 points to 10,534.55.The BSE midcap and smallcap indices fell 0.59% and 0.69%, respectively. 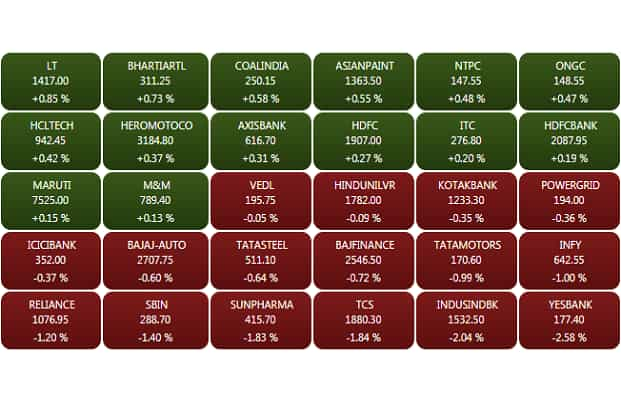 Among the sectoral indices on BSE, capital goods, consumer durables, industrials and basic materials erased losses, while oil and gas trimmed gains and traded flat. On the losing side, IT and realty fell over 1% followed by healthcare, energy and teck. The government is hopeful of higher output in the new year from already allocated mines and plans to further allot 10 mines to state-run behemoth Coal India Ltd (CIL) in 2019, reported PTI. Of the 85 mines already allotted, 23 have already started production and the Coal Ministry expects 20 more mines to begin production in the current financial year ending March 2019 or early in the next fiscal, added the report.Prabhudas Lilladher lowered the rating on Coal India shares to “Hold” and cut the target price to Rs 270 per share from Rs 330 per share, citing “weak operational performance and rising headwinds due to Govt policy on opening up the sector.”Coal India shares marginally higher at Rs 248.75. Intraday, the stock hit a high and low of Rs 250.20 and Rs 246.35. Motilal Oswal initiated coverage on Brigade Enterprises with “Buy” and a price target of Rs 282. “BRGD appears all set for a tactical shift in its portfolio, with a clear focus on scaling up the high-potential leasing business. The company aims to add ~4msf of leasable area to its portfolio over the next five years. Consequently, we expect a leasing income CAGR (FY18-22) of 27% to INR6b (up by a significant 2.6x from FY18 levels).” Brigade Enterprises shares rose as much as 6.51% to Rs 219.90 per share. Maruti Suzuki India Ltd said it will recall 5,900 super carry vehicles manufactured between April 26 and August 1 to inspect a possible defect in fuel filter. Starting December 26, customers will be contacted by Maruti Suzuki dealers for inspection and replacement of the faulty part free of cost. Shares traded 1.04% down at Rs 7,435.35 per share. Intraday, the stock fell as much as 1.43% to Rs 7,406. 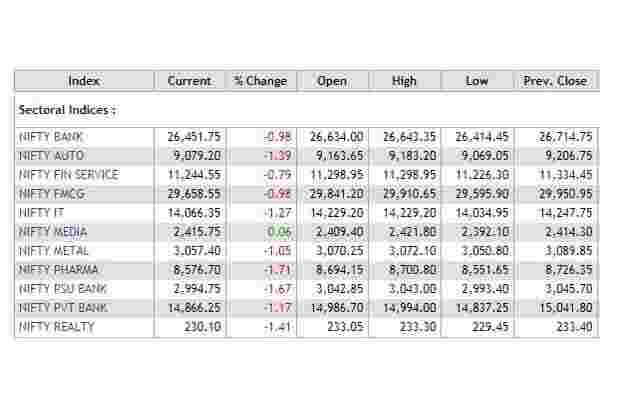 The BSE Sensex traded 289.81 points, or 0.82%, down at 35,180.34. The Sensex opened at 35,470.15 and hit a low of 35,160.78. 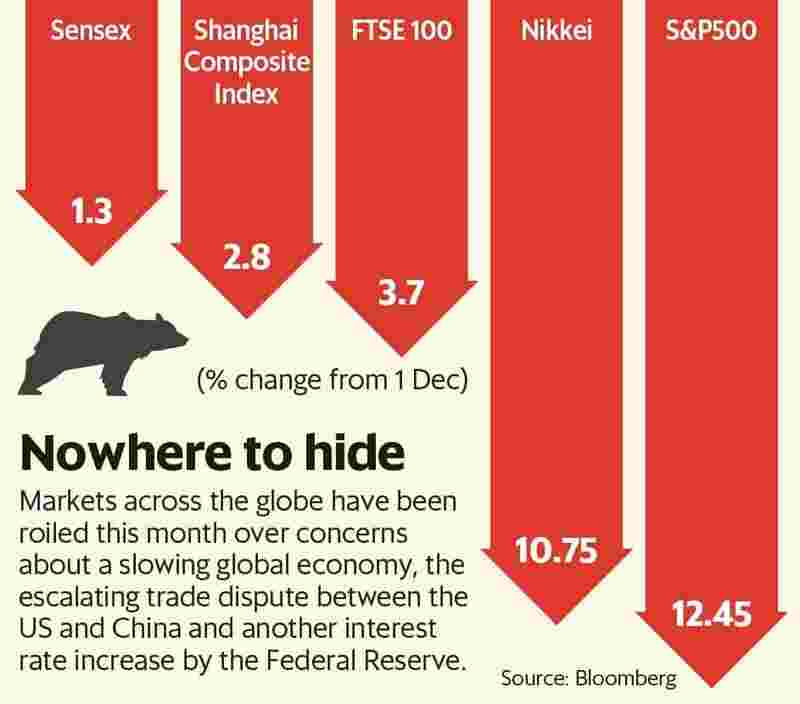 The Nifty 50 fell 73.80 points, or 0.69%, to 10,589.70. The 50-share index opened at 10,635.45 and fell to a low of 10,575.05.The BSE midcap and smallcap indices declined 1.065 and 0.96%, respectively. 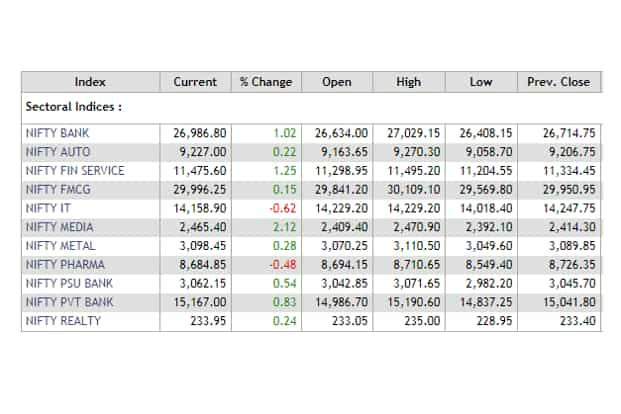 All the sectoral indices on BSE, except oil and gas, traded lower dragged mainly by IT, teck, basic materials, and healthcare, which fell over 1%. Shares of Hindustan Unilever Ltd fell as much as 2.32% to Rs 1,742 per share after GST anti-profiteering watchdog, National Anti-profiteering Authority (NAA), said on Monday HUL has allegedly profiteered to the extent of ₹383 crore after the large scale GST rate cut last November. An order from the NAA posted on its website said that, after allowing for certain deductions, the confirmed amount of tax benefit that the company has not passed on to consumers was assessed at ₹383 crore. NAA asked HUL to deposit ₹223 crore in central and state consumer welfare funds as the company had proactively deposited ₹160 crore with the central consumer welfare fund, set up under the anti-profiteering laws. The Indian rupee gained against the US dollar after Brent crude dropped below $50 a barrel and comments from US President Donald Trump expressing confidence in the Treasury secretary, federal reserve and US economy. At 9.10am, the rupee was trading at 69.82 a dollar, up 0.46% from its Monday’s close of 70.14. Rupee opened at 69.93 a dollar and touched a high of 69.79 a dollar. The 10-year gilt yield was trading at 7.235% from its previous close of 7.287%.